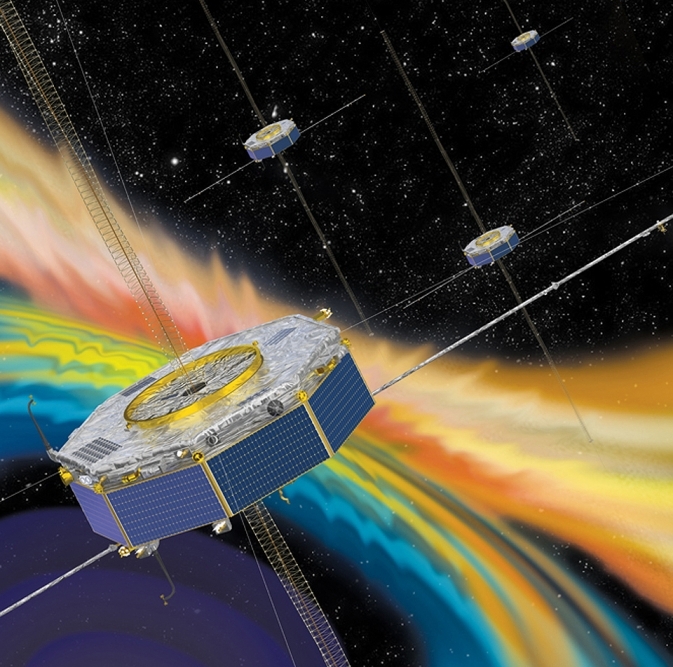 October 16, 2015 – On October 15, 2015, a NASA mission broke its own record: the four satellites of its Magnetospheric Multiscale (MMS) mission are now flying at their smallest separation, the tightest multi-spacecraft formation ever flown in orbit. The four spacecraft are just six miles apart, flying in what’s called a tetrahedral formation, with each spacecraft at the tip of a four-sided pyramid. The close formation is all the more impressive as the spacecraft speed along at up to 15,000 miles per hour and – with their booms extended – each spacecraft covers as much area as a professional baseball stadium. This four-sided pyramid formation is imperative to achieve the science goals of MMS. 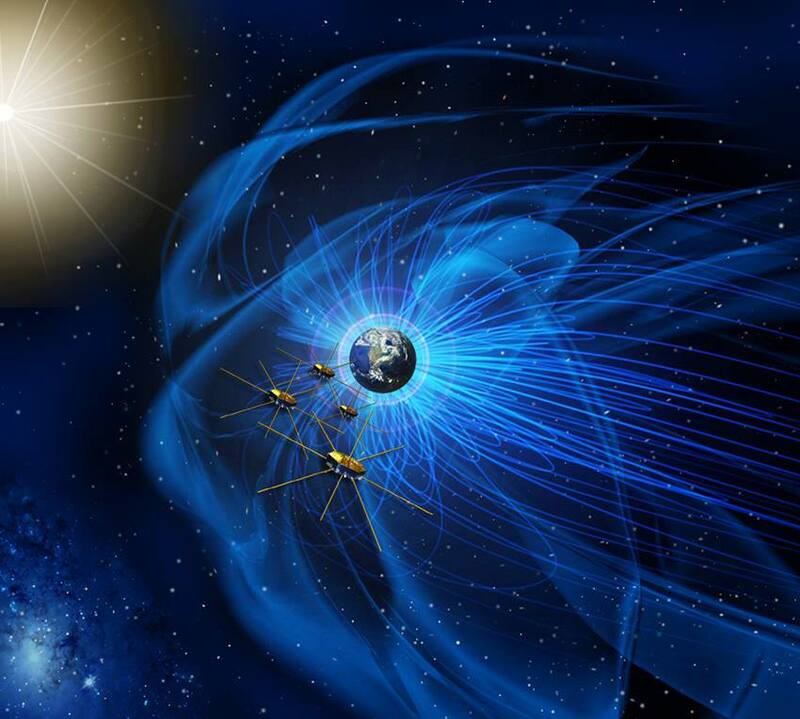 MMS directly measures the space environment at the boundaries of Earth’s magnetic bubble, the magnetosphere, where the sun’s constant stream of magnetized solar wind collides with Earth’s own magnetic field. The tetrahedral formation allows the mission to track events in three dimensions. As it flies through these magnetic collisions, MMS can use its four spacecraft to determine how a given event moves in three dimensions or changes over time. If all four spacecraft moved in a line or a plane, MMS wouldn’t be able to observe the full 3D shape of a structure as it flies through. The MMS team finished its commissioning phase on August 31, 2015, and is now officially in the first phase of its science mission to gather data on the electrical and magnetic properties of the space environment around Earth. MMS gathers data to study a phenomenon called magnetic reconnection, which occurs when the magnetic field surrounding Earth connects and disconnects from the magnetic field carried by the solar wind, reconfiguring the very shape of Earth’s magnetic environment. Magnetic reconnection can result in the explosive release of energy that can accelerate particles to incredible speeds – in some cases to nearly the speed of light. The MMS orbit is designed to carry the spacecraft directly though reconnection events. Reconnection is a common process throughout our universe; occurring in space near Earth, in the atmosphere of the sun and other stars, and in the vicinity of black holes and neutron stars. “Its pyramid formation and time resolution will offer the first ever three-dimensional observations down to the smallest scales of reconnection,” said Moore. When MMS first formed a tetrahedral shape in July 2015, the spacecraft were flying about 100 miles apart. Over the past few months, MMS gradually closed that spacing to just six miles. Another mission, ESA/NASA’s Cluster, had times in which two of its four spacecraft were that close, but MMS is the first mission to hold four spacecraft in such close proximity. 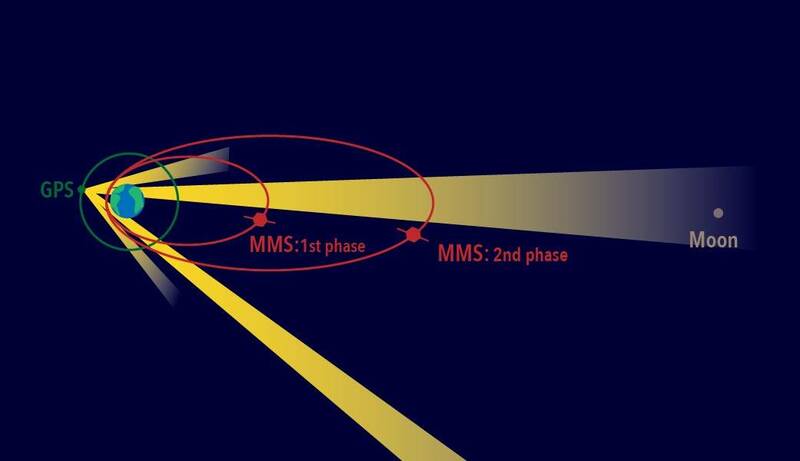 To achieve this milestone, first the MMS spacecraft dropped down to 40 miles apart, then 15 and finally on October 15 the spacing dropped to its closest point, just a little over six miles apart. After operating over that range, the MMS science team will then decide what spacing was optimal and return to that value. 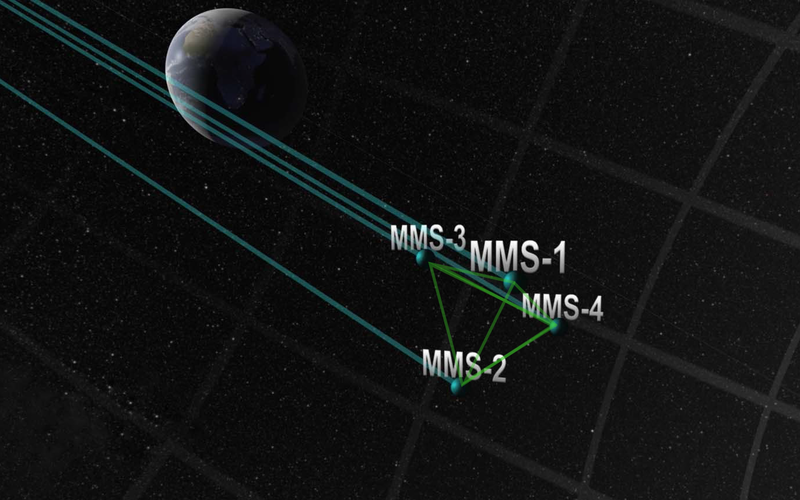 The MMS spacecraft depend on GPS signals for such close proximity. Each spacecraft has eight GPS antennae so that as the spacecraft rotate, an algorithm allows one antenna to hand-off to the next without losing the signal. So far, the MMS “Navigator system” has been more accurate than expected. At the farthest point in its orbit, some 43,500 miles away from Earth, Navigator can determine the position of each spacecraft with an uncertainty of better than 50 feet. MMS is the fourth NASA Solar Terrestrial Probes Program mission. The goal of the STP Program is to understand the fundamental physical processes of the space environment from the sun to Earth, other planets, and the extremes of the solar system boundary. Goddard built, integrated, and tested the four spacecraft and is responsible for overall mission management and mission operations. The Southwest Research Institute in San Antonio, Texas, leads the Instrument Suite Science Team, with the University of New Hampshire leading the Fields instrument suite and Goddard leading the plasma instrument suite with the Fast Plasma Investigation. Science operations planning and instrument command sequence development will be performed at the MMS Science Operations Center at the University of Colorado’s Laboratory for Atmospheric and Space Physics in Boulder.